This superb classic F.B.R Brown design was built in 1973 and has had only 2 owners from new. Brown was noted for his designs of very pleasing, sea-worthy cruising yachts. She has a full keel and an overhanging transom stern. Constructed from carvel planked 7/8 inch utile (mahogany) copper fastened to 1 3/8 inch x 1 1/8 inch steamed oak ribs at 6 inch centres on an oak backbone carrying 1.6 tons of ballast. 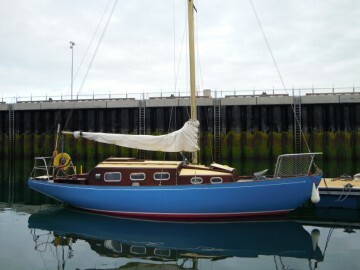 She has a traditional teak deck, very durable afromosia coach roof and self-draining cockpit. Fitted with stainless steel pull-pit, push-pit and guard rails. She is fitted with the classic Dolphin 12 hp engine, a two cylinder two stroke petrol. These engines had a reputation for simplicity and reliability as well as being economical in use. This one has been recently rebuilt and as can be seen in the photos is in excellent condition and capable of many more years service. She has been lightly used and clearly cherished. Her sails were new 1991 and are in excellent condition. There are three plus one berths and standing headroom. A beautiful, classic yacht that has been maintained to a high standard. Forward cabin with single berth, heads compartment and stowage. Saloon with two single berths with foot box extensions. Small aft quarter berth. Good standing headroom. Plastimo 2 burner /grill gas cooker - new 2010. Stainless steel sink. Saturn sails 1991 – Mainsail, No. 1 Jib and Genoa all in very good condition. 24 and 12 volt from 2x12 volt batteries charged from the engine Dynastart system. Original engine, well maintained - bottom end re-built 2008, new piston rings 2013. Interior of cabin/focsle painted and rest of bilge. Port side toe rail replaced approx stern to midships due to storm damage . Some chaffing on planks below toe rail repaired with epoxy resin. Work carried out by professional boatbuilder. Antifouled and hull painted on slip. Every year craned out using spreaders, stored on custom made bogie, protected from weather by tarpaulin but with good ventilation ensured. Full paint job on hull every spring as well as all exterior woodwork, coachroof etc.